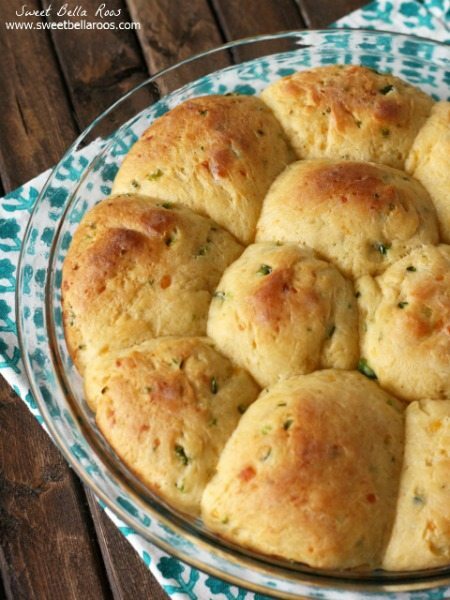 These Jalapeno Cheddar Dinner Rolls are yeasty, not too spicy, and full of bold sharp cheddar flavor. A savory twist on a classic dinner roll recipe. 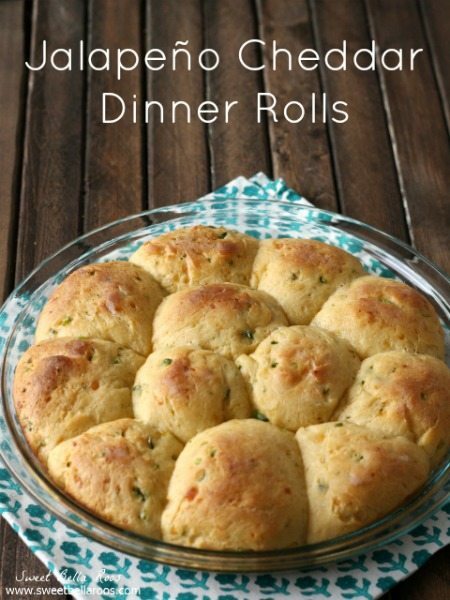 These Jalapeño Cheddar Dinner Rolls are a savory twist on Fleischmann’s classic Dinner Rolls recipe. These rolls are yeasty, not too spicy, and full of bold sharp cheddar flavor. With the help of a stand mixer (and RapidRise Yeast) these no-knead rolls are ready to go in about an hour. I’ve always preferred quick rolls/breads to yeast recipes, partially because I don’t want to wait for the yeast to proof and rise, but also because sometimes cooking with yeast can be intimidating. It really shouldn’t be, though! Once you understand the basics of baking with yeast you will be making light, airy, fluffy breads and rolls in no time. In a nutshell, yeast eats various sugars and excretes alcohol and carbon dioxide. Alcohol and carbon dioxide are what the pockets in bread are filled with as bread bakes. 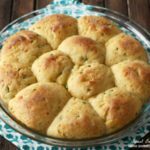 There are a few varieties of yeast, but this recipe for Jalapeno Cheddar Dinner Rolls uses “instant” yeast, instead of “active” yeast. Store the yeast in a cool dry place, or in the refrigerator once the package has been opened. Do not use yeast after the expiration date. 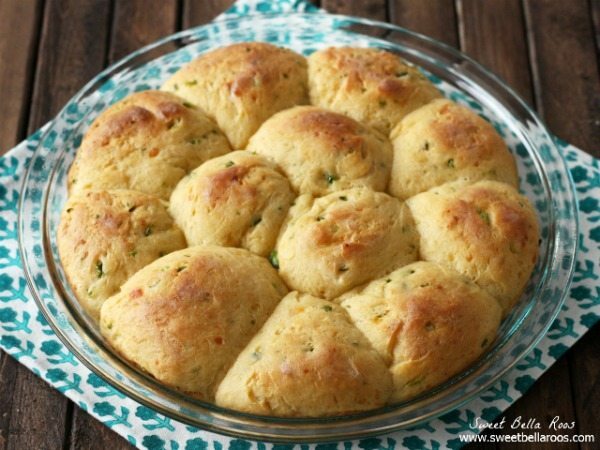 Jalapeno Cheddar Dinner Rolls- a savory twist on a classic dinner roll. Finally a simple recipe for yeast rolls! Combine 3/4 cup flour, undissolved yeast, sugar, and salt in a large bowl. Heat milk, water, and butter until very warm (120-130 degrees F), and add to the flour mixture. Add the jalapeños and cheddar to the mixture. Beat 2 minutes at medium speed, scraping the bowl occasionally. Continue adding 1/4 cup flour and beating at medium high speed until soft dough forms. Using a dough hook, beat an addition 8-10 minutes, until smooth and elastic. Cover; let rest 10 minutes. Divide dough into 12 equal pieces; shape into balls. Place in greased 9-inch round pan. Cover; let rise in warm place until doubled in size, or about 30 minutes. Bake in preheated 375 degree oven for 20 minutes or until golden brown. Top with butter, if desired. Tip: Shred your own cheese instead of buying a bag of already shredded- it's worth it! These were delicious – just the right amount of heat. This recipe doesn’t tell you what to do with the jalapeños & cheddar! Do you mix it all in or layer it in the pan? Sorry about that Jenn. I have updated the recipe. Hi, I am featuring this recipe today at Marvelous Monday tonight….. I love it! My mom is having her knee replaced soon and I would bake her some bread and other goodies during her recovery. bake with friends for the holidays! I’d bake some classic favorites: molasses cookies, and gingerbread for several Christmas bake sales benefiting local Vets, soup kitchens and youth groups! Thanks for an awesome giveaway! I’d make some of these yummy rolls & maybe a Pecan pie (w/the Karo) to give to some friends of ours who are really going thru a hard time, to make their Holidays brighter!!! Thanks for the chance…. I volunteer at a women’s shelter….it would be awesome to make some treats for the ladies and staff there. I’d make bread to share with others at Thanksgiving. I use Kero syrup to make my Christmas deserts. I’m not really sure :/ My church does collect meals though for shut ins My aunt and I are always sending things over so I could def. use this to make something extra yummy! This coming week, I’ll be using their yeast to bake dinner rolls, orange rolls, cinnamon rolls and soft pretzels for a charity bake sale. I would bring in yummy holiday treats to my daughters class. We live in an area with a large amount of low-income families and it’s nice to make the kids smile. I would bake extras and share them with my neighbors! I would bake cupcakes for my grandson’s school fund raiser. I would use it to bake for some members of my family who have special dietary needs and cannot eat a lot of the foods we usually eat. It would be a special treat for them. I would bake something to give to my elderly neighbor. I would use the yeast in my moms friendship bread recipe. I would bake my mom’s jalapeno and cheese bread to share with my daughter’s teachers. I always bake things for a few families in my community every year. If I won this pack, this would mean I could bake for a few more families than I usually do. I bake the baked goods and we go as a family to deliver it. I love to bake! I’ll be making sweet rolls for Hubz’ office. I could bake up something sweet for a gift for my mail carrier and UPS man! I have a friend that bakes holiday meals for local soldiers who have no nearby family and would otherwise not have a holiday meal. Several of us pitch in each year to help her and I would use this to bake rolls or some kind of bread to help her out making the meals. I would also love to bake something for the local woman’s shelter. I would use it to make homemade breads and desserts for our neighbors and my kids school teachers. I would bake something to share with my neighbors. I bake during the holidays and give cookie gifts to my children’s teachers and bus drivers. I would use it to bake some items for my neighbors! i’ve never used them before but i’d use them for some christmas treats! I am involved in giving out bread at our church every other Saturday. Some yeast goes a long way. The Holidays are coming up! There is going to be lots of baking go on at my house for sure! I would like to try my hand at doing some holiday baking. I don’t get a chance to do it very often. I would use them to bake gifts for the holidays. We’re so tight on cash and can’t buy for everyone, but something homemade means more anyways. I would use Fleischmann’s Yeast to make something for our family dinner. These rolls look incredible! I love baking for friends and family in need – especially around the holiday. This would be perfect! I’d love to use them to bake goodies to share with others to spread a little sunshine around. i would use it for my nursing class. I love to bake bread and share with others who are sick. I would use yeast to bake some breads for a bake sale. I’d bake for my family, since we only see each other twice per year! Still, I’d love to try my hand at it again – especially as a special treat for my precious Honey/Hubby – for at least over the holidays – and to go along with all the wonderful homemade soups we make this time of year. P.S. there is nothing like the smell of fresh baked bread! School bake sale, lots of hungry kids! I would bake some special treats for the kids. I would use it to bake some goodies for our neighbors & friends! I’d use the karo syrup to make whoopie pies for a bake sale. I think one really great thing we can all do is just share what we have with friends and family who need a bit of help. It’s pretty easy to bake an extra loaf of bread and drop it off to a family who is struggling. I’ve had people do little things like that for our family in the past, and it is so helpful when things are tight. This is the only kind of yeast that I like! My mom used it and I use it too! I would bake some homemade bread with the yeast – something I haven’t done in years! I would use the Karo syrup to make some pecan pies! Yummy!! I would use the Fleischmann’s Yeast in making my son his gluten free bread he just loves it made fresh ! Baking a Difference looks like a really great idea – what a great time of year to highlight helping other people out too (and the rolls look yummy as well)! I love baking for others. I would bake a different variety of breads (including Garlic Cheese Bread YUM!) with the Fleischmann’s Yeast. Then give it as gifts. I would use the yeast to make some homemade bread for my large family for Thanksgiving. It would be fun to do the 12 days of Christmas using baked goods for a family I know is struggling. I use Fleischmann’s Yeast to bake my own bread and save money, and I share my recipe to help others save money too! Fleischman’s is the only yeast I’ll use! I’ve tried other brands, and they’re just not as good. When I bake things for my sons’ school (bake sales to raise money, teacher gifts, etc.) I always use this brand! I like to make bread with the kids because they get so excited watching the dough rise. I would bake things for needy people at my church! I would use Karo to make divinity and give to our neighbors and my son’s therapist he has autism we have a speech, OT & Behavior therapy! I would help with the bake sale at school and take some baked goods down to the local homeless shelter. I would help out with our schools bake sale. I would use them for my daughter’s Girl Scout Troop. They are having a bake sale this month. Thank you for the chance! A cultural group in my tribe is planning a bake sale to raise funds for a new Canoe. I would use this to bake my heart out for the bake sale! I would use them for rolls to bring to a new mama! I would bake up some desserts for my new neighbors. I simply love to bake for my husband as we both learn together how to eat and nourish ourselves healthily. We have a baby on the way so I’m always conscious of what kind of foods I’m putting in my body! I would use them to help make breads as gift for friends to help them out. I would use them for a school bake sale. I think that with everyone’s food budget is slowly dwindling, we have to teach our children to get back to the basics. Buying convenience foods can make like easier, but with the help of bloggers such as you, I have learned to make my own convenience foods. beans, rice, pasta and home-made breads can lower ones food bill dramatically. So educating those around us is the best defense against hunger. I’d like to bake some holiday breads for some of the elderly shut-ins in my neighborhood. I would use the ingredients to make breads & desserts and share them with my neighbors and people I know who are struggling to cheer them up. I would use the Karo syrup to bake a festive pecan pie for my neighbor, who recently lost his wife. I know that my friend’s daughter is having a holiday bake sale coming up, so I could help them out by baking with them and using these ingredients!